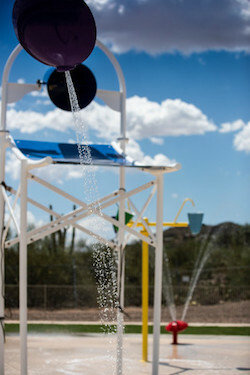 The young and young at heart on Tucson’s southwest side will have a new spot to cool off beginning Saturday, July 28, with the official opening of the Warden Family Splash Pad at Winston Reynolds-Manzanita Park, 5110 S. San Joaquin Ave. The Pima County Board of Supervisors and the county’s Natural Resources, Parks and Recreation Department will hold a dedication ceremony at the splash pad July 28 beginning at 10 a.m. Board Chairman Richard Elías, who represents District 5, will preside. The splash pad will feature water cannons, snake sprays, areas for toddlers as well as older children and a 20-foot-high “Big Tsunami” water bucket. Funding for the $750,000 project came from 1997 and 2004 General Obligation bonds and departmental funding as well as a generous $200,000 donation from Chandler Warden, who oversees the charitable work of his family’s philanthropic organization, the Bert W. Martin Foundation. The Pima County Parks and Recreation Commission voted at their June 8 meeting to name the splash pad in honor of the Warden family. The Pima County Board of Supervisors formally accepted the commission’s recommendation at their June 19 meeting. “The Warden Family Splash Pad is a wonderful addition to Winston Reynolds-Manzanita Park, and we are grateful for the Warden Family’s generous contribution that helped make this bond-funded splash pad a reality,” Elías said.